James Casey was a messenger boy in Seattle in the early twentieth century. He and a few of his fellow messengers, including Claude Ryan, gathered their resources—about $100—and started a small delivery company. Now headquartered in Atlanta, United Parcel Service’s founding is commemorated by a small plaque in the sidewalk on the corner of Second Avenue and Main in Seattle. 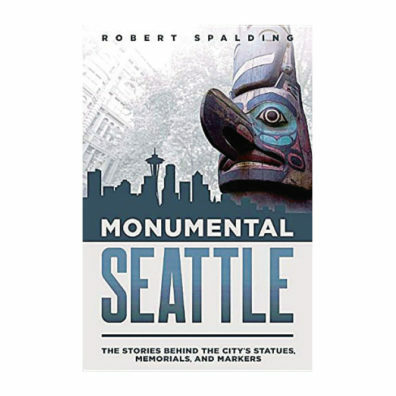 This is just one of the many surprising stories to be found in Robert Spalding’s delightful Monumental Seattle. While many people, having taken the underground Seattle tour, know that Seattle is a city on top of a city, there’s yet another city buried in the fill under streets and piers. The Idaho, for instance, was a steamship built on the Columbia River that worked the cargo routes of Puget Sound for many years. Later, the ship was grounded and converted into a medical clinic that served the poor of Pioneer Square. Still later, the remains of the ship were buried as fill at the foot of Jackson Street. Seattle is actually the site of many thousands of years’ history. While little remains to remind us of the long history of Native presence, the Battle of Seattle of 1856 is memorialized by at least two markers—both of which recall the service of European Americans in beating back an attack by Indians. While the Duwamish and other Native communities are remembered in place-names, their presence has been largely erased in the long occupation of Seattle. This is a thorough-going compendium of Seattle history through the hardware of markers, memorials, and statues. Walking tour guides and anyone interested in the history of the city would benefit from this finely researched book.